The president of a small Maryland college who likened struggling freshmen to bunnies that should be drowned resigned Monday, nearly six weeks after the student newspaper published the comment and ignited a national firestorm of criticism. 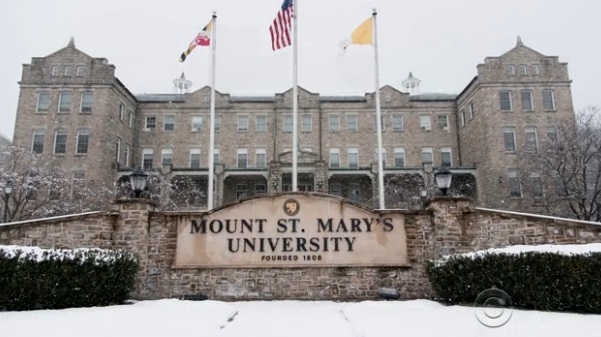 Simon Newman, a former financial industry executive, was in his first year as president of Mount St. Mary's University, the nation's second-oldest Catholic university, about 60 miles northwest of Baltimore. The school of 2,300 was previously known mainly for its four NCAA men's basketball tournament appearances. Newman caused an uproar over his plan to boost the student-retention rate by identifying freshman likely to fail and offering tuition refunds for those choosing to leave. Critics said Newman was too focused on eliminating, rather than helping, struggling students. Newman had fired and later reinstated two faculty members amid the uproar over his plan to identify freshmen most likely to fail. They had been dismissed and the school's provost was demoted after an investigation into the student newspaper's report on Newman's comments. Board of Trustees Chairman John Coyne announced Newman's departure in a statement Monday night after the board met to discuss its two-week inquiry into the matter. Coyne said Karl Einolf, dean of the college's business school, was named acting president. "The board is grateful to President Newman for his many accomplishments over the past year, including strengthening the university's finances, developing a comprehensive strategic plan for our future and bringing many new ideas to campus that have benefited the entire Mount community," Coyne said. Coyne declined an interview request through school spokesman Christian Kendzierski. Pre-law Program Director Edward Egan, who was removed as adviser to The Mountain Echo student newspaper after the story ran, earlier told CBS News: "It's not just the words, but it's the plan the words described. Weeding out students because we think they might not do well in order to make the numbers look better? That's not Mount Saint Mary's." Former faculty member John Schwenkler, who helped organize opposition to Newman among college faculty nationwide, said he was celebrating the news. "I think that the collective efforts of a lot of concerned academics are a big part of this, and I feel privileged to have been part of that," said Schwenkler, an assistant professor of philosophy at Florida State University. "I hope that this is a sign to administrators at other institutions about what the academic community won't tolerate and about the power of that community to unify against certain abuses." Schwenkler started an online petition, signed by more than 8,500 people, calling for reinstatement of Egan and Thane Naberhaus, a philosophy professor, after Newman fired them in early February. They were fired, and the university provost was demoted, after a board investigation concluded the Echo story was a deliberate attack on Newman, perpetrated by a small number of faculty and recent alumni. Egan, fired for "violating the code of conduct and acceptable use policies," was reinstated as a faculty member, but not newspaper adviser, Feb. 12. Naberhaus, who had publicly criticized Newman, was also reinstated after he was fired for violating "a duty of loyalty" to the university. The story that triggered the firings described Newman's plan to identify struggling freshmen and offer them help, or tuition refunds if they chose to leave school early in their first semester. The story quoted from a Newman email saying he hoped 20 to 25 students would leave before the cutoff date for reporting the school's enrollment to the federal government, thereby boosting the student-retention rate, one of the factors publications such as U.S. News & World Report use in ranking desirable colleges. Critics said the plan seemed more focused on weeding out struggling students than helping them succeed. The newspaper reported that Newman had told a faculty member opposed to the plan: "This is hard for you because you think of the students as cuddly bunnies, but you can't. You just have to drown the bunnies ... put a Glock to their heads." Newman later acknowledged he used those words and apologized for them.